DealerX: Eliminate Your Dependency On Cars.Com, Cargurus & AutoTrader – NOW. Key Biscayne, FL – Jan 12th 2019 – Jeff Tognetti of DealerX confirms the rumors, “Yes, We Have The Data, And I Mean All The Data!” What is all the data? Simple, the cross-device automotive active shoppers seen browsing on major automotive portals like Cars.com, AutoTrader, Cargurus, KBB coupled with people walking in to over 23,000 Dealerships & Service Centers nationwide. 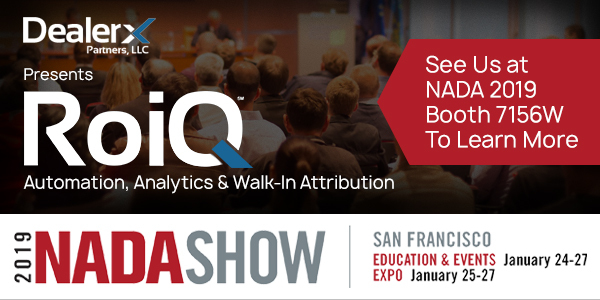 DealerX will be demonstrating how the RoiQ platform leverages billions of daily events in the industry 1st “hands free” marketing automation, analytics & walk-in attribution solution. Seamlessly activating this data via ROIQ omni-channel marketing automation platform (eMail, Direct Mail, Paid Search, Display and Social) to once anonymous, now identified buyers in real-time. The DealerX – RoiQ solution tracks the results of every ad served, impression viewed and which vendor contributed to each lead, call, walk-in or sale. Finally.. giving dealers the true cost of every sale. RoiQ tracks the mobile devices of the majority of shoppers and service customers in a dealers market as they walk into any dealership. Tying out each ad dollar spent to an individual, whether he or she bought or serviced at any dealership while they were targeted. This enables the dealer to determine true closing ratios and lost opportunities, not just what is often misreported in the CRM. “As we speak to Dealers across the country they ask us how they can reduce their digital ad spends and eliminate dependency on 3rd party websites like Cars.com, AutoTrader & Cargurus along with the many other wasteful vendors all offering the same old bag of tricks. Our answer is DealerX’s RoiQ platform, 1-part vendor “BS detector” and the rest, an all-in-one marketing automation platform. RoiQ leverages our patented proprietary technology (real patents – not fluff) which can be leveraged to identify shoppers in any market. Building profiles of these shoppers by capturing their cross-device (PC, Tablet & Mobile) browsing behavior while they surf the web, on auto or non-automotive sites. Feeding RoiQ with insights derived from Machine Learning which identify the specific vehicles of interest, where the shopper is physically located, and even important information like what the buyer maybe trading-in. Along the way answering the question; are those well known automotive portals, blogs and review sites really worth the marketing $$$. Culminating in dynamically built ads, targeted to buyers in real-time often before they’ve ever touched the dealer’s website. That’s Omni-Channel Conquest! Not this other ish* often pushed by “me too” vendors.” Says Jeff Tognetti – Managing Partner. Don’t take our word for it, come see it at NADA 2019 January 24th through the 27th at Booth 7156W. DealerX offers the industry’s FIRST, Marketing Automation, Analytics, & Walk-in Attribution platform with Predictive Scoring rolled into one – RoiQ. DealerX has offices in New York Metropolitan Area and Florida. Our services touch 10’s of millions of consumers every year while our diversified folio of clients range from Large Multinationals, Media Companies, OEMs (Including Volkswagen of America) to select Agencies and many of the Nation’s Top Dealer Groups.